Professional home stagers can put together a home staging checklist for the sellers that includes all the nitty-gritty items that need to be completed. However, for Ballard Seattle real estate at least, the real estate agent usually provides the sellers with home staging tips and an action item list to make sure that the home is properly prepared BEFORE the staging company arrives. The staging company then comes out to see the home, takes photos and measurements and then writes up a quote. A few days later, their truck and crew will reverse up the driveway and begin working with a blank canvas. Virtual home simply involves the listing agent emailing photos of the vacant home to an online virtual staging company. 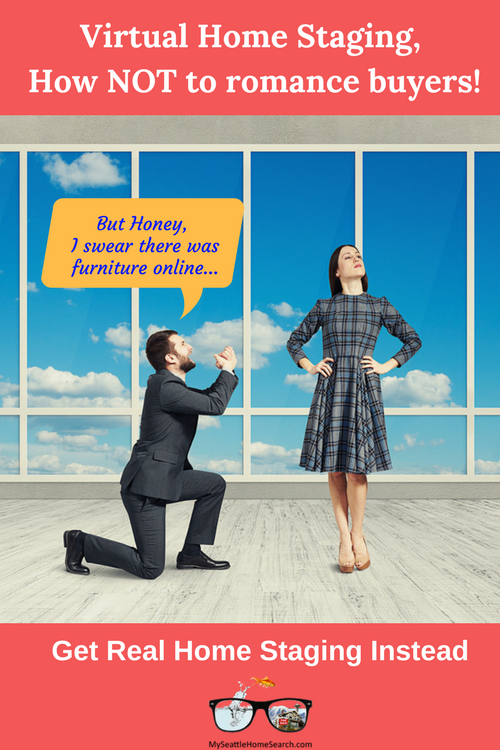 Then somebody sitting in front of a computer uses virtual staging software to Photoshop furniture and accessories onto the photos. Voila! The home is transformed from a soulless, empty box to a home with personality. In reality, however, the home is still an empty box. Sometimes, virtual home staging can be used to stage a home that is still occupied by the sellers. The existing furniture gets virtually replaced with fancier furnishings. You can imagine the confused buyers who compare what they are seeing on their cell phones versus what they see when they go see the home. "Are we in the right house?" Homes need to look great online to hook potential buyers’ attention. Staging combined with great, professional photos will grab buyer eyeballs and make them want to go see a home. In the internet age, good web appeal is critical. At least 90% of home buyers look for homes online. It’s the age of Instagram and photos in the palm of your hand. Virtual staging will definitely give a home some easy web appeal. However, professional home staging will give a home both web appeal AND real appeal. With homes that have been professionally staged, when the buyers walk in the front door, what they see is what they saw on those online listing photos. For virtual staging, the buyer gets to see an empty home and sense of having been duped. A wee bait and switch. Not a good start in trying to romance the buyer to get them to fall in love with your home. It can be hard to read between the lines of online listing photos and with the advent of virtual home staging, you might be none the wiser... until you go see the home. The short answer is that you get what you pay for! Virtual staging cost between about $50 and $100 per photo depending on the company and the number of photos. Cheaper by the dozen I suppose. So 15 virtually staged photos would cost about $1,000. Based on my experience, for example, for the Ballard Seattle, professional home staging (with real furniture and accessories) will cost between $2,500 and $4,000 depending on the number of rooms and the particular rooms that you want staged. So for a professionally staged home, you are paying between $1,500 and $3,000 more than the virtual version. Considering that the staging company has to come out to the home to put together a staging quote, come back with a truckload with furniture and accessories, employ a crew to move all that stuff, leave it there for 5 weeks and then return to un-stage the place... well that $1,000 for virtual staging doesn't seem so cheap after all. However, the home that has real home staging will probably sell for more and offset the additional costs. You're probably thinking, why spend all that money when there are no guarantees of the home selling? You could end up with a big staging bill and an unsold home. Well if your prepare and price the home properly, it WILL sell. I have never had a home that I had staged fail to sell. Why I stage ALL my listings. Unless the home is tear down or a major fixer-upper, I’ll stage it! You can argue that a professional stager is obviously an advocate for staging your home when you list it for sale, because well, they get paid when you use their services. Same as you could argue that a Realtor would advise someone who wants to sell their home via a For Sale By Owner (FSBO) would be better off using a Realtor. However, as a Realtor, if a home is vacant, I’m more than happy to pay for it to be professionally staged. Yes, I'm willing to cough up thousands of dollars to stage a home. I think the advantages of staging a home are worth every penny, even in a red-hot Seattle real estate market where almost all homes sell. I believe that homes that are staged and properly prepared for the market will sell for more than the same home that is listed empty, with no staging. Yes, it’s like I’m the cheesy host of my very own contrived and cheesy HGTV program. Cue some homeowners weeping! A listing agent is hired and paid to market a home and get the best possible price for the home. When they skimp on staging, the seller is not getting the best possible service..... regardless of the prevailing market conditions. Why bother staging a home in a hot real estate market? One of the main functions of the listing agent is (1) to sell the home and (2) get as much as possible for the home and that means making the home look its absolute possible best. Selling is one thing. Getting the absolute maximum for the home is another thing. Selling a home in a hot market is let's say, easier than in a buyer's market. However, getting the absolute most money possible for the home is the listing agent’s responsibility. And that includes not skimping on staging and marketing the home. Having home buyers walk into a vacant, soulless home is not presenting the home in its best possible light. Home Staging is not a cure-all for real estate ills. That applies to both virtual staging or staging a home for sale. Do homes without professional staging sell? Absolutely. Are all homes that are professionally staged guaranteed to sell? Definitely not! Home staging is not going to save a home that is over-priced, has major repairs issues or is in a bad location. You still have to prepare the home properly, inside and out, clean, declutter, take care of the landscaping, touch up the paintwork, and do any needed minor and major repairs. You need to focus on the 3 critical P's when selling your home. A Profile In Home Staging report by the NAR looked at listing agents’ and buyers agents’ opinions on professional home staging. Note that this study looked at real home staging, not virtual home staging. 33% of buyer’s agents said staging a home for sale increased the value by 1 to 5% and 25% said it has no impact. 77% of buyers’ agents said staging made it easier for buyers to visualize the listing as a future home and 38% said it would positively impact the home’s value if decorated to the buyer’s taste. 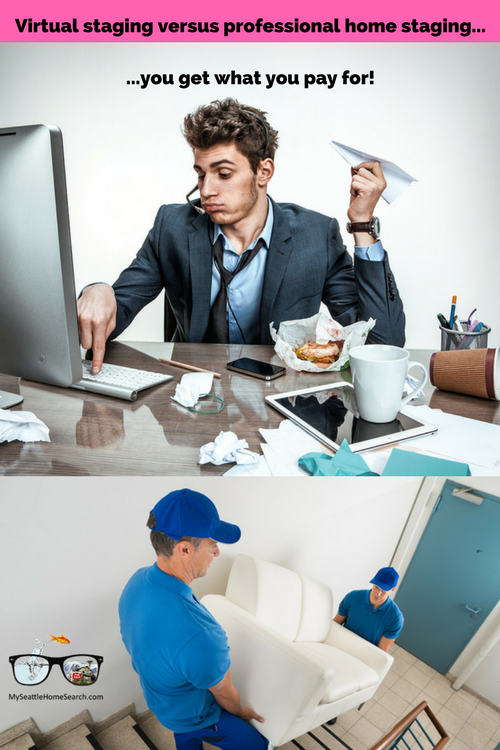 27% said staging would make a buyer overlook other property faults. 9% of buyer agents said staging can negatively impact the home’s value if the style did not match the buyer’s taste. Being an ex-science guy, I naturally have to pick holes in these kinds of surveys. As with all surveys, this one has limitations too. The findings are purely subjective! Look at the difference in opinions between listing agents and buyer agent on the perceived impact of staging a home for sale on the sale price of a home. The listing agent, who is an advocate for staging naturally believes that staging has a bigger potential impact on the sale price compared to the agent who is representing the buyer. It is almost impossible to prove that home staging will make a home sells for more money because you would have to sell the SAME home TWICE, once vacant and once staged… in the exact SAME week to the exact SAME set of buyers. Obviously, that’s not possible. You could try listing 2 identical, side by side, new construction condos/houses at the same time. One vacant and one staged. However, the staged one would influence the vacant one since all buyers would look at both the homes and both would likely sell for the same price. Where’s Einstein when you need him! Having said that, I still believe that staged homes sell more quickly and for more money and generate more offers and cleaner offers. Can I (or Einstein) prove it? I real home staging way better than deceptive virtual staging. No Einstein needed to answer that one! 40+ Home staging tips to get your home sold quickly from Luke Skar. Strategies used to make home sellers more money from Jeff Nelson. Staging does not sell a home from Bill Gassett. 10 Easy home staging tips from Sharon Paxson. 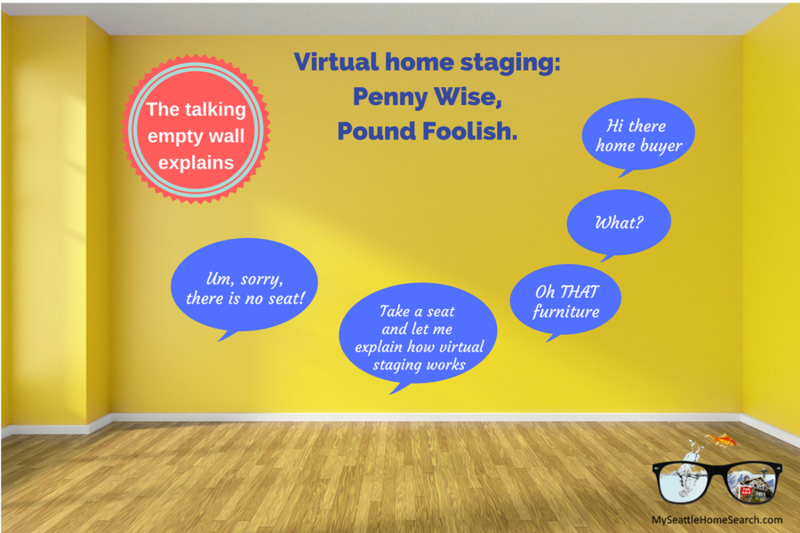 The above article "Virtual home staging, penny wise, pound foolish"" was written by Conor MacEvilly. Conor is a Realtor living in the Ballard neighborhood of Seattle. He works with both home buyers and sellers in the greater Seattle real estate market and on and on the Eastside in neighborhoods like Redmond, Bellevue and Kirkland. Since everything is online now, checking out real estate has also become online. There is no doubt that to avoid the extra costs of home stagers, the virtual staging is a new and affordable thing that sellers are now going to. I disagree! I NEVER fully stage vacant listings ... I only virtual stage them. They sell just as fast. Now, of course, it depends on the market. But in my DC metropolitan area, it is worth saving the money and virtually staging as opposed to fully staging. Nothing will sell a house that is NOT ready to put on the market. You still need to paint, repair, carpet, etc. But I have never failed to sell a vacant listings ... and I love virtual staging! Thanks for your feedback. Most home will sell regardless of whether they are staged or not since it all depends on the home itself and how well it is prepared for market. Staging is the cherry on top that makes the homes look its best when buyers go to see it in person and real staging will help buyers visualize the flow of the home way better than photo-shopped furniture and and empty home that greets the buyers of virtually staged homes. Sure virtual staging is cheaper but probably not when it comes to the final sale price.